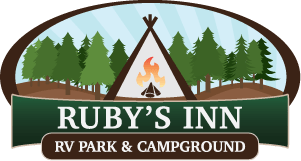 We had a wonderful, stay ( June 19th-22nd )at the campground at Ruby’s Inn! It’s less than a mile from the entrance to Bryce Canyon. Price is very reasonable, plus–anything you might need or want is right there…groceries, restaurants, camping supplies, gifts,laundromats-name it! Five stars! Had a great experince staying at the Campground. Great location near the park. Bathrooms and showers were clean. Best of all you can drive your ATVs right to the MANY trails near by. It was a great time! Wonderful place! Great amenities. Friendly people. Miles of A TV with amazing views with access from the campground. We camped in an authentic tipi there and it’s was wonderful! 2 nights – and we were just a mile from Bryce Canyon. Price was great! Staff was very helpful – Bathrooms and showers very clean. Just do it… you know you want to! Looking forward to bringing the grand kids back some day. Camp store stocked only with necessity items and some trinkets to remember your trip. Send your postcards right from the front desk! We have stayed here twice. My kids love the tipis. It’s located just a couple minutes from Bryce Canyon National Park entrance. Great experience. I would highly recommend this campground. Nice campground. Close to park entrance. Friendly staff. Was great to be able to catch the perseids meteor shower at it’s peak here, made lot’s of wishes that night, one of them was to be able to return here soon! Great staff. Really close to Bryce Canyon National Park. Spacious enough sites and definitely shady. Their little campground store has a few necessities, and the General Store within walking distance had everything else you could possibly need. Great showers and excellent sites! Best place ever! Not only a very well kept campground but fantastic team, excellent service, courteous team, caring and go the extra mile to accommodate and help. We had an awful experiences with cruise america’s RV, and Ruby’s RV park & campground helped us all the way until we found a dry place to sleep. We stayed at this campground while visiting Bryce Canyon National Park. It is very close to Bryce which makes it very convenient. They have an information booth on the property and are very knowledgeable and eager to give you needed information regarding Bryce and the surrounding area. They have a shuttle pick up right in front of the campground which is great. No need to take your own vehicle, just let them pick you up and drive you around! Great! Also they suggested that we take the special tour bus that is driven by people who have been in the area for years. It was well worth it and it didn’t cost anything extra to do it. By taking this special shuttle you got to see things that the other shuttles don’t – highly recommend this! The campground was clean, bathrooms very nice and people in the office very helpful. Would recommend this campground when visiting Bryce. Location very close to town, we walked there several times to look around. Town is not very big, but gave us something to do in the evenings.